Heckler & Koch USP pistol replicas are some of the most appreciated from the collectors and recreational shooters, because very similar and reliable. This new version, proposed by Umarex is even more realistic, thanks to its blowback system, reloading automatically by the back moving of the slide. 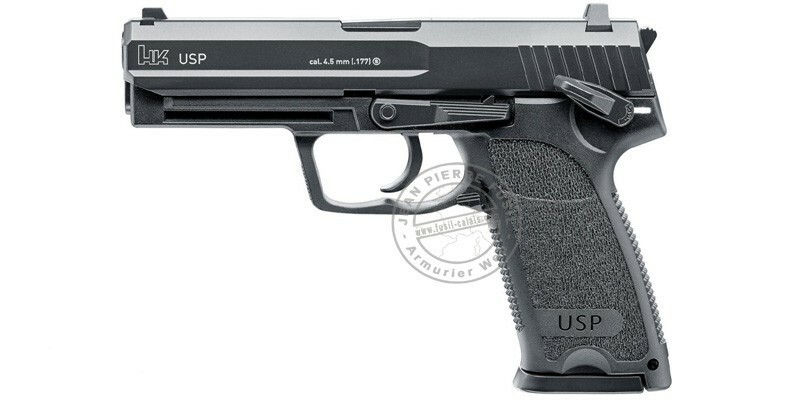 Semi-automatic replica of the Heckler & Koch USP (Universal Selbstlade Pistole). Its ammos, steel BBS .17 bore, are powered by a 12g Co2 cartridge. The all-in-one magazine integrates ammos and CO2 cartridge. It goes out pressing the magazine catch lever, located ont the back of the trigger guard. The CO2 cartridge is inserted at the bottom of the magazine, and the BBs in the stick. The magazine has a capacity of 16 BBs. The metal slide is blowback, that is to say it moves back when shooting, giving a very realistic visual effect, and also more sensations in the hand. The body is made of polymer, as the original. The trigger can be used in single or double action : diret pull or hammer cocking. It has a manual safety lever. Its natural sights are fixed, and have white points for a better visibility. The front and the back of the stock have surfaces with small points, allowing an excellent handling.